FastVal records all deviations as they occur during electronic test protocol execution. If a test step fails during testing, FastVal automatically generates a record of the issue. Testers document what happened when they executed the test case. Deviations can be documented with text and screen capture. This information can be further augmented as root causes and corrective actions are identified. Deviation status is tracked and can be viewed in real time by Quality Managers. Tracking deviations during testing is one of the most fundemental expectations of validation. Validation departments are expected to record the issues raised during validation and ensure that these issues are properly addressed before systems are released. Deviations can be categorized by the type and the associated risk, which facilitates disposition. FastVal also tracks root causes and corrective actions. 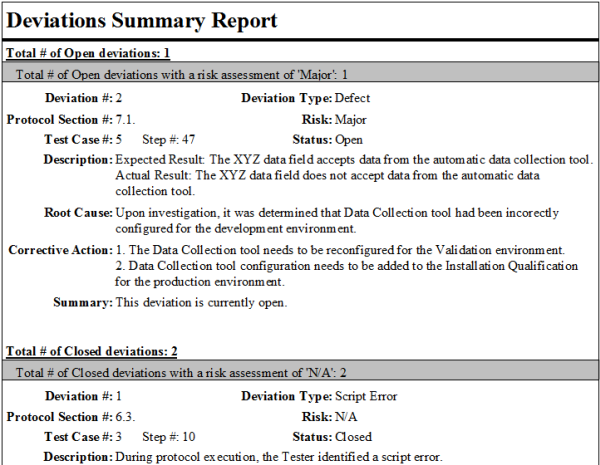 FastVal can generate text to document certain standard deviations, including script deviations or tester errors. FastVal has a wide variety of deviation metrics than provide you with knowledge about the types of deviations being generated, the severity of the deviations and time required to close the deviations. You can export deviation records from FastVal into your own templates or use the FastVal collection of deviation reports. FastVal can manage this process, or deviations can be exported to your existing CAPA system for resolution.